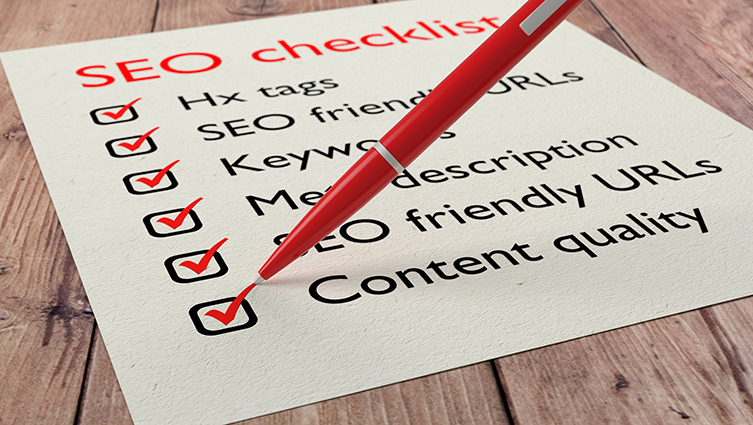 Here is our On-Page SEO Checklist. It’s not a definitive list because SEO is always evolving but it is a good starting point. We are focusing on On-page SEO first. I don’t know who said ‘control the controllables’. It seems to be attributed to many different people from business and sport. Whoever said it was very wise. On-page SEO is something you can control. With some time and effort, you can create a well-crafted and optimised page or post. All you have to do is follow some simple guidelines. If you are using a tool like Yoast SEO then it becomes even easier. The off-page elements, such as high-quality backlinks, are harder to achieve. Search engine bots (short for robot, a computer program that runs automatically) spider your site and they are looking for clear markers. They are looking for consistent and focused keywords. Bots are guided by a set of guidelines or rules. They use a complicated algorithm, that needs to assess and mark off content that it is indexing. The Bot is assessing your site to see if it complies. It does not think. It does not hate you or your site. The Bot is driven by one goal – to try and find the best result for any given keyword. You don’t have to follow it’s rules – but don’t expect to rank highly if you don’t! Search engine bots can’t think! Clients think the search engine is more clever than it is. They almost humanise it and give it the power of reason. Clients say things like ‘We sell widgets and they are available in loads of colours. Why aren’t we Number 1 for Blue Widgets?’ The answer is simple – ‘Do you have a page or product called Blue Widgets? If not, then you probably won’t rank for it.” This is a recurring theme with clients. To a human it is obvious that you can get Blue, Green and Purple Widgets from the company – but not to a search engine bot. You need to tell them ‘we sell blue widgets’. This is fundamental to understanding how a search engine works. If you don’t tell the bot, if it isn’t written down, it doesn’t know – so it can’t rank you. Simple. Make sure content is high-quality, relevant and at least 300-500 words in length. Try to create content that is so good that visitors will want to share your content. Include the target keyword in the page URL if possible. Your Title tag should be unique, include the target keyword. Must be 70 characters or less. Meta description is the marketing copy for your page. Include your target keyword. No longer than 160 characters. Target keyword should be in page headline (H1 tag) and one sub-headline (H2 tag). Page includes relevant images that support the target keyword. Captions for images and/or graphics include the target keyword where applicable. Check spelling or poor grammar. Search engines will penalise either. Make sure you include social media links, user discussions, comments or reviews. Remember, pages with active visitor interaction are scored higher than static pages. Use links to other pages on your website wisely. Links should always be on topic. Internal links can help search engine bots navigate your website. Optimise all images to improve page load speeds particularly on mobile devices. Add SSL certificate so all information is secure – even if you only have a contact form. Our On-page SEO checklist is a starting point but hopefully, it helps demystify the basics of SEO. There are far more authoritative articles on this subject elsewhere. I’d recommend reading Google’s guidelines, taking the free Webmaster Academy course and visiting sites like searchengineland.com. You will build up your knowledge and understand that Google is driven to achieve excellent results for its customers.